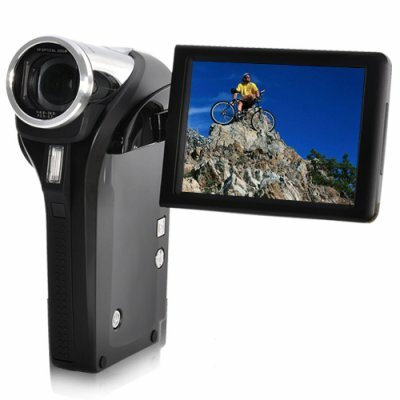 Successfully Added HD-DV Pocket Camcorder (Digital Video Camera - 1080P) to your Shopping Cart. Fantastic HD-DV mini camcorder that captures 1080P video at 30FPS and 720P video at 60FPS!!! We've been getting tons of requests recently for a truly pocket sized 1080P camcorder, and after carefully listening to which features you would like in a budget 1080P camcorder, we are happy to bring you the CVFU-DV05. Not only did we fit in all the standard DV camera features you were expecting, we did you one better - an ultra compact model that can support SD cards up to 32GB's! This unit dazzles by providing 30 frames per second in 1080P mode or a stunning 60 frames per second in 720P mode. Simply snap in an SD or SDHC card and you are immediately ready for recording hours and hours of high-def footage! Oh and did we mention it also takes 5 megapixel photos and has a beautiful 3 inch screen with 270 degree rotation. This is a great HD digital videocamera at an even better wholesale price and is provided with Chinavasion's famous 12-month warranty. If you are an EBay power seller this is one product you cannot afford to miss! Available right now with factory direct low china wholesale price. Does this product come with a flash? Yes, there is light flash functionality for the digital still photo camera only. i have had mine for a few months now and i can't believe the price and the good quality for such a cheap price. i will for sure tell family and friends about this camcorder. a+ for me !!!!!!!!! on 2009-08-12 06:43:18 Excellent product for the money. Great HD quality at 1080p or 720p. Stabilizer ok although with such a small device , you do need to maintain a steady hand. Zoom capabilities are good, Very lightweight, nice features. Does not ship with an extra battery (Need to order). Very good camcorder! Convenient, qualitatively made. This videocamera really one of the best variants. I hope to buy yet less than 10 these pieces camcorders. on 2009-06-20 03:51:16 Very much worth the money. This camera takes great pictures and the buttons that operate the camera are very intuitive. Ships with an extra battery and solves all the disadvantages I read in reviews about camcorders of similar size and price.